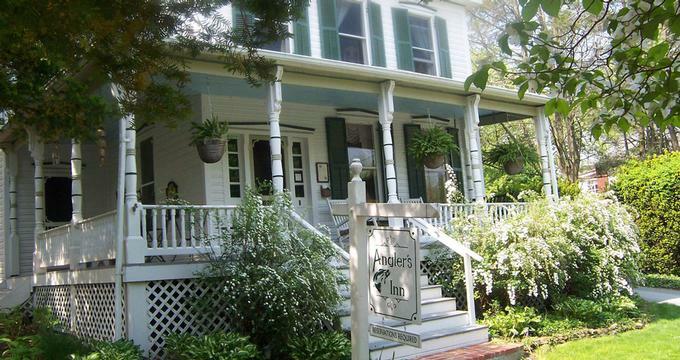 Located on the main street of Harpers Ferry, the Angler's Inn Bed & Breakfast is beautifully restored the 1880s Victorian home that promises a tranquil retreat. This cozy bed and breakfast has been providing guests with a comfortable home-away-from-home escape for nearly 10 years. A perfect spot to relax and enjoy the architecture of days gone by and the spectacular natural surroundings, the clapboard building has a comfortable parlor and wraparound porch where guests can gather and enjoy the ambiance. The inn features individually designed and decorated guest suites which offer modern comforts and conveniences, as well as welcoming communal area where visitors can relax. Four exquisitely decorated guest suites have comfortable bedding, private en-suite bathrooms with luxurious soaking tubs and separate showers, spacious sitting areas, and lovely garden views. A communal lounge has comfy sofas and plenty of reading materials where guests can meet each other, socialize and relax over snacks, hot beverages and drinks that are served in the afternoon and evenings. A delicious home cooked gourmet breakfast is served each morning in the main dining room and includes a range of hot and cold dishes, including eggs, sausages, bacon and French toast accompanied by freshly brewed coffee, tea, and fresh fruit juice. While the Angler's Inn Bed & Breakfast offers a perfect place to relax and unwind, the little town of Harpers Ferry provides a plethora of things to see and do. Harpers Ferry is a historic town in Jefferson County that lies at the confluence of the Potomac and Shenandoah Rivers. Best known for John Brown’s raid on the Armory in 1859 and the vital role it played in the American Civil War, Harpers Ferry is partly located in the Harpers Ferry National Historical and offers a range of activities, attractions and exciting sites to explore. The Appalachian Trail Conservancy (ATC) headquarters can be found in the center of the town, which is only one of a few through which the famous hiking trail passes through. Harpers Ferry is also a popular destination for outdoor enthusiasts and adventure lovers, and popular activities include hiking, mountain biking, rock climbing, fishing, white water rafting, canoeing, tubing, and zip lining. Beautifully appointed guest rooms at the Angler's Inn Bed & Breakfast are individually decorated to create comfortable havens of tranquility. Spacious and roomy, guest rooms feature private en-suite bathrooms with separate showers and bathtubs, vanities and plush towels. 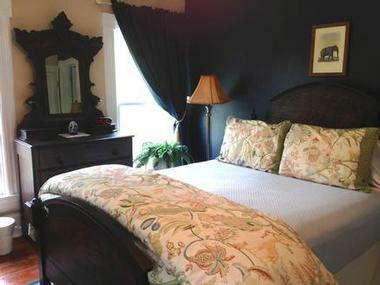 Sunny sitting areas have period furnishings, and complimentary wireless Internet is available in each room. Named for Royal Fenwick, a character in Daughter of the Stars, Phyllis Whitney's mystery novel about Harpers Ferry, the Fenwick Room isbright and airy with a king-size bed, which can be converted into two twin beds if required. The bed is dressed with comfortable mattresses, pillows, and luxurious linens and a private en-suite bathroom feature a beautiful ball and claw bathtub and separate glass enclosed shower. Plush towels and deluxe bath products add a special touch. The Fenwick Room’s sitting area is sunny and light and offers ample space to relax with a good book. Quaint and romantic, the Remington Room is named after the previous owner of the Inn and features a comfy queen-size bed with beautiful handcrafted linens, plush mattresses, and soft pillows. A private en-suite bathroom has an antique bathtub, separate glass-enclosed shower, thick towels and deluxe bath products and a sunny sitting room boast beautiful views over the adjacent pine tree forest. Named after President George Washington, who was a friend of Robert Harper and played a role in the development of Harpers Ferry, the Washington Room features a luxe queen-size bed in gorgeous linens and a comfortable daybed with a twin mattress in the adjacent sitting room. The main bedroom has a private en-suite bathroom with luxurious soaking bathtub and separates glass-enclosed shower, thick towels, and deluxe bath products, and the living room looks out over the lush garden. Located on the first floor of the inn known as the Garden Level, the McKenzie Room has a set of French doors that open on the back porch of the inn and into the garden. Named after the man who designed the little wooden fishing boats used on the lake, the McKenzie Room features a lovely queen-size bed dressed with comfortable mattresses, pillows, and luxurious linens. A uniquely designed en-suite bathroom features a walk-in shower, lush towels, and deluxe bath products and a lovely sitting room offer the perfect place to kick back and relax with a book. 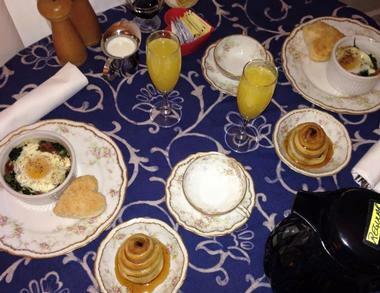 Guests staying at the Angler's Inn Bed & Breakfast are treated to a delicious gourmet breakfast every morning, which includes continental or hot breakfast selections. Breakfast delights range from creative fruit dishes, homemade scones, pastries and breakfast bread, blintzes, toasted almond French toast, omelets with sausages, bacon, and tomatoes and freshly brewed coffee, tea, and fresh fruit juices. Complimentary homemade chocolate chip cookies and a selection of hot beverages, including coffee, tea, and hot chocolate are served in the parlor every afternoon and evening. The Angler's Inn Bed & Breakfast does not serve dinner, but there are several good restaurants in the nearby vicinity that serve a range of cuisine. Located in the Lower Town, the Secret Six Tavern serves continental cuisine accompanied by live music with indoor and outdoor seating areas and beautiful views of the Potomac River. Upper Town is home to the Anvil Restaurant and the Canal House, which serves continental cuisine and have full service bars. There are also several restaurants and bars in the nearby towns of Shepherdstown and Charles Town, just a short drive away. 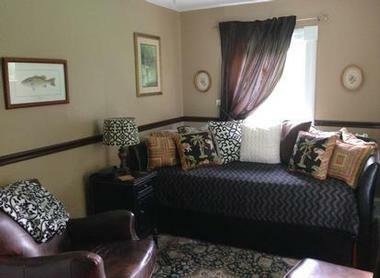 Amenities at the Angler's Inn Bed & Breakfast include a complimentary gourmet breakfast served in the sunny dining room every morning, a comfortable communal lounge and wraparound porch for guests to relax and enjoy, and homemade snacks and hot beverages served in the afternoons and evenings. The Inn is within walking distance of a variety of cafés, coffee shops and restaurants in Harpers Ferry for casual of fine dining choices, as well as boutiques, shops, museums and galleries to explore. Outdoor enthusiasts and adventure lovers can enjoy the spectacular natural scenery and great outdoors with a variety of leisure activities, including hiking, mountain biking, rock climbing, fishing, kayaking, canoeing, whitewater rafting and horseback riding. The friendly staff at the Inn can provide advice on the best things to see and do in the area and arrange excursions, guided tours, and other trips. Located at the confluence of the Potomac and Shenandoah Rivers, Harpers Ferry offers a range of activities, attractions and interesting sites to explore and enjoy. The little town is divided into Lower and Upper areas, each of which offers their own attractions. Located just downhill from the Angler's Inn Bed & Breakfast, the Lower Town of Harpers Ferry is home to the Harpers Ferry National Historical Park, which was established in the 1950's to preserve the historical landmarks in the town from the damage of flooding that can occur from the rivers. Guests can take a shuttle from the Inn or take a take a 1.5-mile stroll to the Cavalier Heights Visitor's Center in the Park. Visitors can explore the town with a range if guided tours and excursion, including walking, historical, cultural and ghost tours, with the Harpers Ferry Ghost Tour being a legend in its own right. The Lower Town is also home to a number of historic buildings, museums, and fine examples of architecture from before during and after the Civil War, which can be explored and enjoyed on guided walking tours. There are also many interesting shops, cafés, and restaurants en route to browse and grab a bite and drink along the way. The beautiful natural area surrounding Harpers Ferry offers excellent walking, hiking, jogging, running, and mountain biking along the Potomac and Shenandoah Rivers, including the C&O Canal Towpath, which runs from Cumberland in Maryland to Washington, D.C. and passes right by Harpers Ferry. The Angler's Inn has a large patio for storing mountain bikes and preparing for your ride if you decide to bring your own. The Potomac and Shenandoah Rivers offers a fantastic venue for a variety of water sports, including kayaking, canoeing, tubing, fishing, swimming, and river excursions. 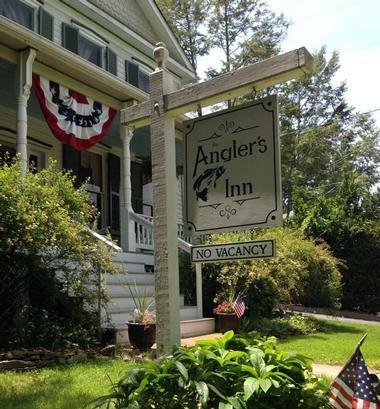 The Angler's Inn offers guided fishing trips from the hotel. The Northern Virginia Region is home to a plethora of wineries and vineyards that produce award-winning wines, many of which are within close proximity to Harpers Ferry. Visitors to the wineries can enjoy tastings and cellar tours, as well as soak up the magnificent natural scenery in the area. Head into the hills of Maryland’s mountainsides on horseback with a range of horseback riding trails offered by Elk Mountain Trails, which offer horseback riding trails for all levels of rider. For those wanting something more relaxing, Harpers Ferry has several day spas such as the Vivo Day Spa and the Tranquility Day Spa that offer indulgent body treatments, pampering massages and a range of salon services, including manicures, pedicures, hair styling and makeup services.